11.8" x 11.8" stitched on 14 count. 9.2" x 9.2" stitched on 18 count. 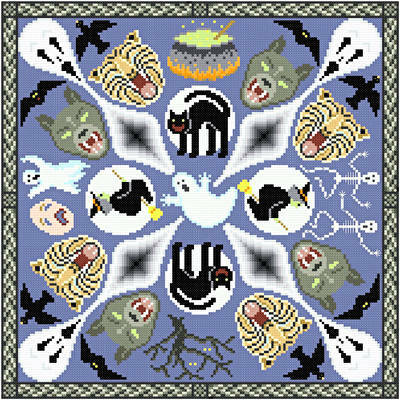 House of Horrors cross stitch pattern... Images of frightening things appear on dark background. Addition of Glow in the Dark threads (source listed) add interest. May be used as a Halloween design. Colors may be changed. Whole and back stitches.